» NHL Grab Bag: It’s the Stanley Cup Final, Dammit! NHL Grab Bag: It’s the Stanley Cup Final, Dammit! I have no idea how they narrowed this down to just 15 minutes. I could watch an hour. And yes, I realize we’re getting dangerously close to the point at which we need to invoke the Bryzgalov Rule and disqualify Darryl Sutter from the comedy star section. I’m just not ready yet. Check back after the playoffs end. Via Twitter’s @ryan_logar, Drew Doughty’s reaction to the Kings’ Game 7 overtime winner is everything you could hope for. Happiness, glass-pounding, and just a little bit of trouble on the dismount. Way to stick the landing, Drew. With the Kings and Rangers meeting in the Cup final this week, we’re pretty much obligated to feature an obscure player who suited up for both franchises. There are plenty to choose from, including some not-so-obscure Hall of Famers like Wayne Gretzky, Luc Robitaille, and Jari Kurri. It was tempting to go with famed “hockey heartbreaker” Ron Duguay, but I’m not sure he’s all that obscure either. So instead, this week’s obscure player is one who not only has links to both teams, but also to a classic Stanley Cup final moment: a talented but injury-prone young center named Nathan LaFayette. LaFayette’s name will be instantly recognizable to fans of the Rangers’ last Cup-winning team, even though he wasn’t on it. In 1994 he was a 21-year-old rookie with the Vancouver Canucks when they met the Rangers in a Game 7 showdown at Madison Square Garden. Late in the third period with the Canucks trailing by one goal, LaFayette found himself alone in front of Rangers goalie Mike Richter. He beat Richter, but rang his shot off the iron. That was as close as the Canucks came to tying the game, and minutes later the Rangers were lifting the Stanley Cup for the first time in 54 years. Most hockey fans who are old enough to recall the ’94 final will remember that moment. What many forget is that LaFayette was actually traded to New York the following season in a deadline deal for backup goalie Corey Hirsch. He dressed for 17 games as a Ranger before being dealt again the next season, this time to Los Angeles as part of the blockbuster deal that brought Kurri and Marty McSorley to New York. L.A. would be the last stop of his NHL career. He played parts of four seasons there and was out of the NHL by 1999 at the age of 26. Injuries and inconsistent play limited him to just 187 career games, and his five goals in the 1997-98 season were a career high. He may have never quite lived up to the promise that made him a third-round pick in the 1991 draft and a member of Team Canada’s gold-medal squad at the 1993 World Juniors. But he’ll probably be the subject of more than a few toasts around New York over the next few weeks by Rangers fans who remember him fondly — even if they’ve forgotten he actually played there. This week’s debate: The eyes of the hockey world are focused on the Stanley Cup final. Or wait, is that the Stanley Cup finals? You’ll find people using both. But is one version correct? In favor: Yes, one version is correct. It’s “final.” Singular. Not plural. “Finals” is wrong. Opposed: Actually … yeah, you’re right. The NHL always refers to it as the final. I can’t really argue with you on this one. Opposed: Hey, when you’re right you’re right. In favor: I’m glad to hear you say that. A lot of people get this one wrong every year. In favor: Excuse me? Yes, actually, I’ll have you know that it is a big deal. In favor: Yes it is. If it wasn’t, would I have spent my entire week correcting absolutely everyone who said “finals”? Opposed: You … you did that? In favor: Oh, sure. I even set up a Twitter search just so I could find people to harass in real time. I do it every year. In favor: Because this is important. Opposed: I’m not actually sure that it is. In favor: Besides, calling it the “finals” doesn’t even make sense. There’s only one series being played. What kind of self-respecting sports league would go around calling it the finals? Opposed: You mean other than the NBA? Opposed: Never mind. Forget I brought that up. In favor: Anyway, this is deeply important and I’ll continue to make it my life’s mission to correct anyone who gets it wrong. Opposed: Hey, chill out. I agreed with you, remember? In favor: All right. Sorry, I get a little worked up about this sometimes. You’re right, it’s just a small thing. No big deal. Opposed: Ha-ha. So I guess it’s fair to say that’s your “final” answer? In favor [smashes a beer bottle; waves the broken stump around wildly]: IS THIS SOME SORT OF DAMN JOKE TO YOU? In favor [breathing heavily]: Sorry. Sorry, my bad. Look, it’s possible that I missed a few hugs as a kid, OK? Correcting people over minor grammatical errors is all that I have. And I’m not alone. This week is kind of a big deal for hockey fans who are also pedantic grammar scolds. Opposed: Wow. I never realized. In favor: Yeah, this week is basically our Super Bowl. Opposed: Don’t you mean “Super Bowl”? In favor: I WILL EAT YOUR CHILDREN! The final verdict: Be sure to join us next week when we debate “alternate” vs. “assistant” captains. Wednesday’s opening game featured a relative rarity: a power play late in a tie game. It came when Brian Boyle was called for slashing at the 18:24 mark of the third, giving the Kings a man advantage for the rest of regulation and the beginning of overtime. They didn’t score, so the call will largely be forgotten, but it shouldn’t be, because the rule that produced it is dumb. Or at least the way the rule is called these days is dumb. Slashing is a pretty basic NHL penalty — you whack a guy with your stick, you get two minutes. It’s also a judgment call, which means officials can pick and choose when to call it. And they do, all the time. If the old saying about how holding happens on every NFL play is true, it’s probably also fair to say that slashing (and holding and crosschecking and roughing) happens on every NHL shift. The officials can’t call everything, so they use their judgment and typically call only the most obvious stuff. But when it comes to slashing, there’s an exception: If you slash a guy’s stick and it breaks, the penalty is basically automatic. That’s true even if the offending slash isn’t much of a slash at all. That’s what happened to Boyle, and it could have cost the Rangers the game. The rulebook itself doesn’t say anything specifically about sticks breaking, but the “broken stick = automatic penalty” interpretation has evolved into the de facto rule over recent seasons. Former NHL referee Kerry Fraser covered this topic a year ago, and he more or less defended the rule. The argument is that the rulebook says slashes should be called if they’re “forceful or powerful,” and breaking a guy’s stick in half seems like pretty good evidence of that. And that was probably true 20 years ago, when players were using wood sticks that didn’t break often. But today’s composite sticks break all the time, and it doesn’t take much to do it. Sometimes they may even be broken already, but stay intact just enough that the players don’t realize it. On one shift, you can two-hand a guy’s stick as hard as you can and it won’t make a dent; on the next, you brush up against it and it explodes. If you want to make chopping a guy’s stick illegal, then go ahead and call it. You could also make the stick fair game and let everyone hack away. Or you could pick a middle ground and let the officials use their judgment, like they do on so many other calls. But it shouldn’t be left up to random luck, which is essentially the situation we have today. That’s a cop-out, and the league should fix (or at least clarify) the rule before it costs somebody a playoff series. I’m not sure I know what to believe in any more. The Rangers have returned to the Stanley Cup final after a 20-year absence. What’s the best way to mark the occasion? If you said “travel back two decades and enjoy a dramatic recap of their 1994 playoff run, set to an impossibly sappy pop music ballad,” then today is your lucky day. • So this is the CBC’s post-playoff montage, which presumably ran just after the Rangers had defeated the Canucks in a classic Game 7. These days, just about everyone agrees that Hockey Night in Canada does the best montages in pro sports. Back then, you had to sit through the duds, but they’d still come through with an occasional gem. This is one of them. • The idea here is to capture the journeys of both the Rangers and the Canucks, building up to their eventual battle in the Cup final. And who better to get us there than Mariah Carey? Look, 1994 was a weird year for pop music. Just be glad it didn’t go with “Closer” or something by Ace of Base. • Our first clip is Pavel Bure’s legendary Game 7 overtime winner against the Flames, which he celebrates by flinging his stick helicopter style. I always wondered where that landed. I feel like somewhere there’s a guy in a Flames jersey still wandering around impaled with that stick and nobody is helping him. • It took us six seconds to get a shot of Mark Messier looking all leader-y. That’s way longer than I expected. • Messier scores on a breakaway. You may want to get used to seeing breakaways because, as we’ve discussed before, this was the early ’90s and defense hadn’t been invented yet. Don’t worry, the trap is coming to put an end to all this fun by next season. • Oh look, there’s Bure again, I bet he’s about to score some beautiful goal that will OH GOOD GOD HE JUST MURDERED SHANE CHURLA. • Time for a round of “How many games would that get today?” I’m going to go with: one billionty. Maybe half-a-billionty since it’s the playoffs. In 1994, we all thought that Bure doing this to an enforcer was the greatest thing ever. It was a strange time. • The mandatory shot of a hockey player with stitches over his eye, per Canadian law. • Hey look, it’s Wendel Clark taking a slap shot for the second time in his entire career. This one works out a little better for Kirk McLean than the first one did for Curtis Joseph. • And there’s Greg Adams scoring the overtime winner to eliminate the Leafs and put the Canucks in the final. Trevor Linden touches the trophy, which is obviously why Vancouver ended up losing. A real leader like Messier would never do such a thing. • I miss those cheesy “The Chance May Never Come Again” montages that the CBC used to do. Those things were great. I just thought I’d mention that. • Apparently bored of standard-issue breakaways from the blue line, players are now getting them from the sideboards. Every NHL team’s early-’90s defensive system was indistinguishable from a kid playing NHL 2014 for the first time without realizing he’s holding the controller upside down. • There’s Stephane Matteau celebrating an OT winner against the Devils, although oddly, it’s not the more famous Game 7 version. We don’t even get to see that one, although we do get Messier’s super-awkward hug attempt with Mike Keenan. • Oh, apparently Messier did touch the trophy. Huh. It’s almost like that whole “don’t touch the trophy” thing is just superstitious nonsense. • And now we’re into the Cup final, and one of our first highlights is the Bure penalty shot. Unless you were a Rangers fan, this was a crushingly disappointing moment. We all thought Bure was going to do one of three things: come in at full speed and blow by Mike Richter before anyone even realized the play had started; that crazy stick-to-skate-to-stick thing that only he could do; veer off and elbow a dazed Churla in the head again. Instead, he basically just did the same move he used against the Flames, and Richter stops him fairly easily. Such a letdown. • And now it’s time for the trophy presentations, as handled by Gary Bettman’s sullen teenage brother. You know, I’m actually pretty sure they didn’t give Brian Leetch the Conn Smythe after Messier got the Cup. Nice try, CBC. How do I sign in to IMDb and log this as a continuity error? 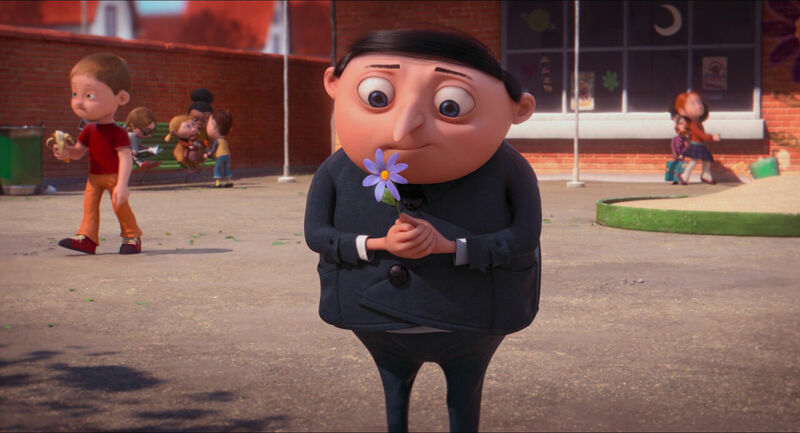 • By the way, my wife thinks that early ’90s Bettman looks like Gru from Despicable Me in that scene from his childhood. She feels very strongly about this and wanted me to mention it. • And that’s pretty much it. We get one more awkward Keenan hug, in which he sets the record for most time spent near Esa Tikkanen without yelling “Shut up, shut up, what language are you even speaking?” Then it’s a quick shot of the Rangers’ team photo, and we fade to black. The 1994 Rangers were a really good team — they had 112 points and won the Presidents’ Trophy. And they weren’t as old as you remember them: Leetch was just 26, leading scorer Sergei Zubov was 23, 50-goal man Adam Graves was 26, Richter was 27, and even Messier was just 33. At the time, it seemed reasonable to expect them to be in the Cup mix for years to come. Instead, Keenan backstabbed them and bolted for St. Louis, Messier signed with the Canucks a few years later, and by 1997 the team had started a streak of seven consecutive years of missing the playoffs. They didn’t win their division again until 2012, and didn’t return to the Cup final until this week. Can they pull off the upset and bring the Cup back to New York? It’s hard to say. But you can bet that somebody at the CBC is furiously searching through the “overwrought schmaltz” section of iTunes just in case.